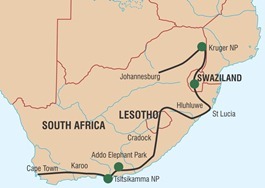 Comprehensive and affordable 20-day accommodated safari of South Africa includes the Kruger Park, Lesotho, Swaziland. > This safari start in Johannesburg, and ends in Cape Town. > Experience the wildlife of the Kruger National Park with game drives. > Explore the scenic Panorama Route. > Cultures of Swaziland and her people. > Explore the wet-lands of St Lucia with a boat cruise. > Diverse wildlife of Hluluwe National Park. > The majestic Drakensberg Mountains. > Tribal cultures of Lesotho. > Beautiful Cape Garden Route. > Oudtshoorn and the Cango Caves. > Vibrant city of Cape Town. A wonderful journey of exploring scenic regions, trekking, spectacular game viewing, wonderful historical and cultural visits to give you an first-hand experience of South African uniqueness! From US$ 2,835 per person sharing. > 20-nights in standard lodge accommodation. > All transport in safari vehicle. > Game drives and activities as per itinerary. > Meals to be taken at lodge restaurants, as stated in itinerary. > All your personal expenses and drinks. We will climb Table Mountain in the morning admiring the views over Table Bay and Cape Town. Spend the afternoon catching up on last minute curio shopping or just lazing on the beach absorbing the Cape’s sunshine.